Look at the colours and smells of flowers and learn which ones attract which insects. Smell and look at the cut flowers. 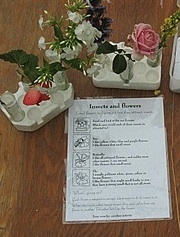 Use the clues below to find out which insects would be attracted to each flower. Bee: I like yellow, white, blue and purple flowers. I like flowers that smell sweet. Butterfly: I like all coloured flowers - and unlike most other insects, I can see red. I like flowers that smell sweet. Fly: I usually pollinate white, green, yellow or brown flowers. I like flowers that might smell funky to you - they have a strong smell that is not all sweet. Each flower is adapted to attract one or more kinds of insects to it. When the insects collect nectar to eat, they move pollen from one flower to another. The pollen fertilizes the fowers. A good activity to follow this one is Insects and flowers bingo (the second page of the attached graphics file). Modify to include non-insect pollinators: hummingbirds pollinate flowers that are usually red or orange, and don't need a smell.